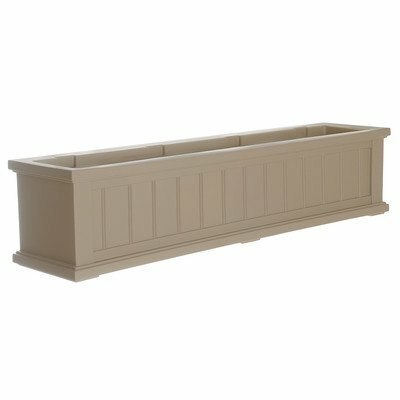 4841-C Size: 48", Color: Clay Features: -Included with each window box is a set of wall mount brackets (3 - 4) that allow for easy removal of the planter making fall cleanup a breeze. -Window box planter. -Beaded panel design. Material: -Plastic. Shape: -Rectangular. Drainage Holes: -Yes. Water Resistant: -Yes. Warp Resistant: -Yes. Rot Resistant: -Yes. Product Care: -May need power washing and possible light scrubbing with mild detergent to maintain a bright, clean finish. Country of Manufacture: -United States. Material Details: -Polyethylene. Size 48" - Capacity: -10 Fluid Ounces. Size 36" - Capacity: -7 Fluid Ounces. Dimensions: -36" window box planter: 44"L. Overall Height - Top to Bottom: -10.8". Size 48" - Overall Width - Side to Side: -48". Size 48" - Overall Product Weight: -20 lbs. Size 36" - Overall Width - Side to Side: -36". Size 36" - Overall Depth - Front to Back: -8". Size 36" - Overall Product Weight: -13.5 lbs. Warranty: Product Warranty: -15 year limited. If you have any questions about this product by Mayne Inc., contact us by completing and submitting the form below. If you are looking for a specif part number, please include it with your message.